Hunters that come the distances they do from all over the country are obviously concerned about being able to hunt fair chase. We get asked the question all the time, "Do you release pheasants?" Our response is always the same. "No". We never have and never will. My question is: why would anyone want to come to South Dakota to shoot a pen raised pheasant when they can do that much cheaper in their home town area? The UGUIDE difference is high natural production through well managed habitat, farms and annual pheasant life-cycles. Many times hunters will ask, "Will we be combined with any other hunters? We prefer to hunt with our own group." From the start, one of the founding principles of UGUIDE was that each group or party had its own style and culture of hunting and therefore combining groups was never a good idea. Your land and lodging package is private and exclusive to just your group for that week in the schedule. You have the whole place to yourselves and we also rest the properties on the front end of your hunt. Having grown up hunting whitetails in Minnesota and Wisconsin (and pheasants in Iowa for 20 years staying in motels and hunting public), I became introduced to the very special (deer) camp tradition those states hold. The "Camp" type experience was built into the UGUIDE system by following the principles above. That translates to your group, your lodging, your land and your special unique experience. 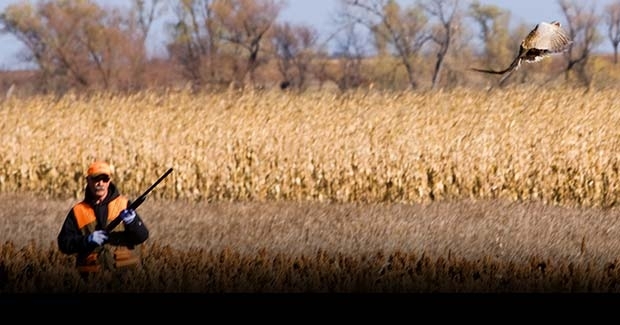 In South Dakota, hunting fair chase pheasants combines all the unpredictable factors that make the experience special and unique like farming, weather, natural production, hunting pressure, dog skills, hunter skills, shooting skills and the journey to get to your destination. One of the greatest benefits many hunters talk about experiencing while at a UGUIDE Pheasant Camp is "Camaraderie". I can assure you, nowhere else will the wily roosters of South Dakota be more challenging and worthy of chase. In the early years of UGUIDE, it became very apparent that lodging was required in conjunction with the land to complete the fair chase pheasant hunting experience. Essentially hunters just needed a "place to stay" and did not want to pay a lot for lodging. For this reason, it became important for the landowner/outfitters to also provide the lodging in association with their hunting offering. The top requirement for hunters was to have access to high quality habitat that held only naturally produced birds. The lodging was provided out of necessity. Now keep in mind that all of these UGUIDE camps are run by full time producer farmers and ranchers. The fall pheasant season coincides with their busy harvest season giving them little time to spend with their guests. The guests are OK with this because they like the self sufficiency of the "UGUIDE" system. It is important to fully understand and appreciate that we are not in the retail lodging business or the full service outfitter business but we are in the "habitat that naturally produces a lot of fair chase pheasants" business. So once you understand where the value is in our system, you can understand and play your role in the Owner-Hunter-UGUIDE Cooperative Model. Everything to you need to know about Reserving Next Years UGUIDE South Dakota Pheasant Hunt.